After a few temporary setbacks medical wise, we are back cooking, writing about and enjoying the world's singular best food -- pasta. In the next few weeks of this lovely summer season, we will be providing some of our favorite simple and flavorful pasta recipes - with the emphasis on simple: easy to prepare during the lovely summer, yet bright with fresh flavors and ingredients. Stay in touch and let us know what you think! Suggestions gratefully received. We just discovered this recipe, tried it, and loved it, and present our adaptation of it here. We are indebted to Michael Bauer, restaurant critic of the San Francisco Chronicle, who gathered this recipe from Evan and Sarah Rich, proprietors of the wonderful eponymous restaurant of theirs in San Francisco: The Rich Table. 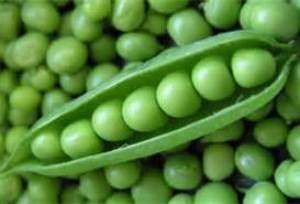 Bring the peas to a boil in a small pot of salted water. Cook for two minutes, remove from heat and set aside. In a saute pan large enough to handle the spaghetti, heat the olive oil, add the garlic and cook until the garlic starts to sizzle. Drain and add the spaghetti to the heated saute pan with the oil and garlic. Add the half cup of vegetable stock, teaspoon of salt and bring to a boil. Stir.Add the lime juice, the peas and the crumbled cheese and stir. Cover the pan, turn up the heat to high, and cook over high heat for a minute or two. Add the butter, stir again, and toss with the half the mint. Add some fresh ground pepper, taste for salt. Serve and garnish with the lime zest and extra mint.